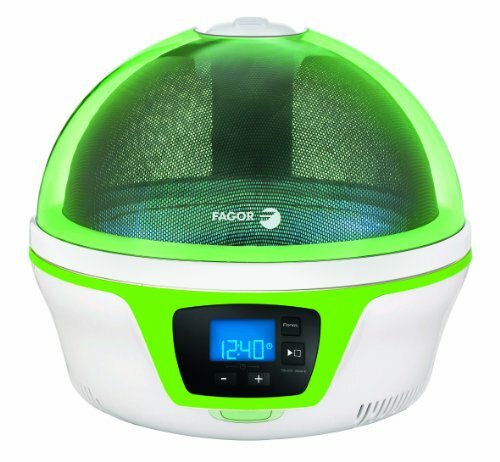 The Fagor SPOUT7GF is a green microwave, with a quirky dome shape, featuring a 28cm turntable, 700w of power and a digital display. Looks good, works incredibly well, novel design. The vents needs to be left uncovered to avoid overheating. 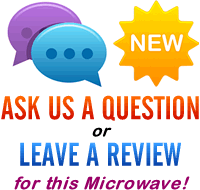 After a green microwave? The SPOUT7GF from Fagor is part of their Spoutnik range - a series of unusual dome shaped microwaves. If you like this model, then you'll have the option of the Blue Fagor Spoutnik, Green Fagor Spoutnik or the Purple Fagor Spoutnik - meaning there should be a colour scheme to suit most people's tastes. The advantages of this rounded design mean that you can easily view the food from all angles whilst it cooks - as well as easily clean the microwave after use. It also takes up less space than a traditional microwave, meaning it will be ideal for those without much kitchen work surface available. The overall design may not appeal to all - however if you're after a slightly funky and quirky looking microwave then it's well worth considering. Measuring 36.9cm by 32.7cm by 42.9cm, and featuring a 28cm turntable, it should accommodate most plates and dishes, and the 4 power settings - ranging from high, low, reheat and defrost, should provide an option for most meals. The digital display is very easy to read, and the controls are refreshingly simple to operate. The timer goes up to 60 minutes, and was easy to setup. Overall power output is 700w - and we found it heated and cooked evenly with no cold or uncooked spots. One of very few green microwaves on the market, the Fagor SPOUT7GF Spoutnik works very well, looks great, and is easy to clean. 4 different power levels: Re-heat, High temperature @ 700w, Low temperature @ 500w and defrost setting. Hi Basil – Unfortunately as far as we’re aware this model has been discontinued – we couldn’t find any for sale on the web – however if you’re just after a green microwave then we have several listed. You may be able to pick one up on eBay second hand – hope this helps!